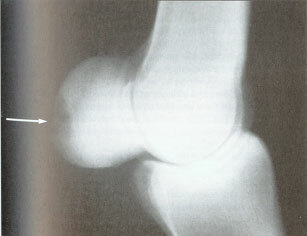 Fetlock injuries are a common cause of lameness. Any of the ligaments or other anatomical structures of the joint, like the sesamoid bones, may be involved. Sesamoid problems have always been recognised as particularly difficult to treat and many horses have been left unsound as a consequence. There will be heat, perhaps swelling at the back of the fetlock with acute weight-bearing lameness that is unresponsive. Radiographs show injury to the sesamoid bones or their attachments as per the picture below. Even very slight changes can be significant. It is important to appreciate the reason why these injuries are so difficult to treat and it lies in the nature of the joint and the dynamics of the limb; also the opposing influences of body weight and concussion. Every time the fetlock is engaged in movement, the ends of the damaged tissues tend to separate and this is why they don’t repair. The secret of successful treatment is to confine the horse, provide support to the joint, ease tension on the fetlock and then stimulate repair with a laser or ultrasound. Depending on the degree of injury, a Paten shoe may help by lifting the heels; a strong elasticated bandage such as a Vetrap will provide adequate support for the joint and daily treatment will usually bring a successful repair in four to six weeks. 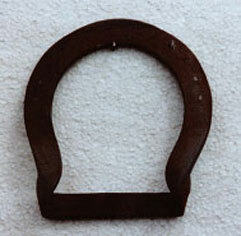 The shoe is then removed and the horse allowed a few days still confined to allow a return to normal weight bearing before being turned out or returned to exercise. Most cases recover fully and have no trouble standing up to work. Petergray.org.uk | Powered by Mantra & WordPress.